What do you do when you need to find something on the web? That’s right – you Google it. Of course there are some other tools like Yahoo and Bing but let’s talk straight – with 82% share of the Search Engine Market during the past year, currently Google is totally dominating. Imagine that you have an online store for office furniture. There are about 50 000 daily searches for the keyword combination “office furniture” alone. If your site is on the first or on the second position in the organic Google search results, it will attract 60%-70% of this immense traffic and all of these searches are potential customers. Sounds really awesome but there is one little detail – you have to get your site to Google’s top places. This is where SEO, standing for Search Engine Optimization, comes in hand. It can’t be easier, can it? The data you get after your query can be theoretically divided into the four groups from the above. First and most important is the Google PR (Page Rank). The Page Rank is an algorithmic scale that shows how popular a particular site is. 10 is the maximum and 0 or N/A is the absolute minimum. Sites with PR 10 can be counted on the fingers of your two hands – the most famous are Google.com, usa.gov and Twitter.com. When seeing that Facebook.com, LinkedIn.com and Adobe.com are with PR 9 you can imagine how tough it can be to raise your PR. It is basically like climbing a mountain – the higher you go, the steeper and harder it gets. For this reason it is much easier to go from 2 to 3 than from 7 to 8. The second most important metric that SEOAuditor represents is the Alexa Ranking. Alexa.com is a web information company that is a one of the oldest in its field and that is why its evaluations are highly respected. What Alexa does is to measure the traffic a particular site generates, to assign it a unique coefficient and to place it in its Global Rank. Contrary to the Google Index, the lower the number is the better. Just like a car race – the first is the winner and others are runner-ups. It is not hard to guess that Google has Alexa rank 1, Facebook – 2, Wikipedia – 6 and Adobe – 67. In order Alexa to measure your traffic you have to install a special plug-in toolbar on your site, or your visitors have to have it installed on their browsers. If you don’t have the plug-in, you won’t be indexed. Do not underestimate Alexa, as it is one of the most valued SEO parameters. Next are the SEO Moz DA (Domain Authority) and PA (Page Authority). They are practically one and the same as DA concerns the domain and its sub-domains and PA concerns only a particular page. They both show the likelihood for a particular domain/page to rank higher in search engines’ results. The highest value can be 100 and the lowest – 0. DA and PA are algorithmic components just like the Google PR, so respectively it is easier to jump from 20 to 30 than from 70 to 80. Their calculation is based on the combination of many different factors. 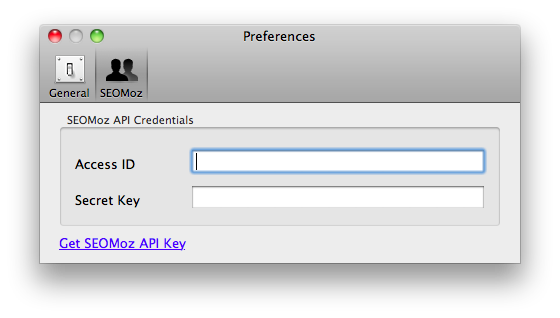 In order the SEOAuditor to be able to extract the DA and PA from seomoz.com, first you have to sign up in seomoz.com. After the registration, a special ID number and a Secret Key will be distributed to you. 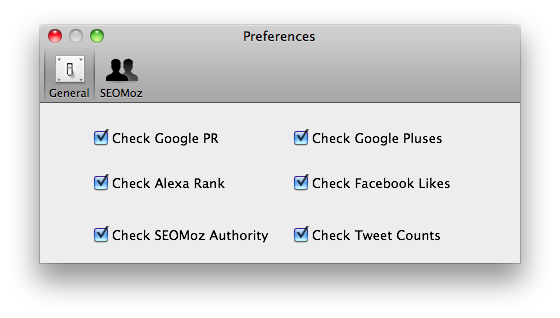 Input them in the preference tab of the SEOAuditor and that’s all. Last but nut not least important are the social metrics. For the moment they represent information only from Google+, Facebook and Twitter but in future more will be included. 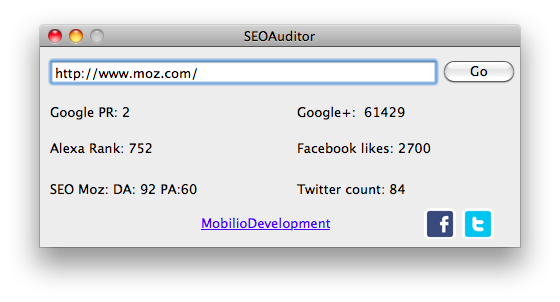 SEOAuditor is a real time saver. Agree that it is more beneficial to check how many people like you or follow you in the social networks with a single click of a button than by constantly browsing your profiles in Facebook, Twitter and Google+. Despite many of the pluses of SEOAuditor have already been listed there are still some aren’t mentioned. The biggest advantage of SEOAuditor is the fact that it is distributed absolutely for free. Most of the SEO tools that are sold at specific prices but they are actually no different from it. As mentioned above, the SEOAuditor has exceptionally intuitive design. The app is neat and compact and at the same time offers its users a great functionality. It is currently available on the Mac App Store. Also you can find the iOS version here and the Android version here. Check out all SEOtools from Mobilio. 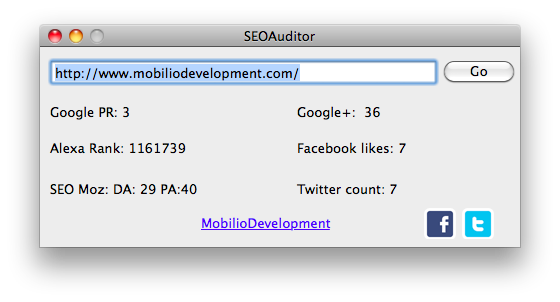 Here you can see how to work with the SEOAuditor for OSX by watching our video tutorials. This software is 100% Compatible with Mac OS X from Snow Leopard (OS X 10.6) to Yosemite (OS X 10.10).